Weld-Crete® bonds new concrete, stucco, tile setting beds and terrazzo to any structurally sound surface, interior or exterior. Use Weld-Crete’s® open time to your advantage in bonding to concrete shear walls when you need a time lapse between application of bonding agent, placement of reinforcement steel, placement of formwork and placement of concrete. The original chemical concrete bonding agent, Weld-Crete® incorporates polyvinyl acetate homopolymer in a patented formulation. For exterior and interior use, Weld-Crete® will bond new concrete, Portland cement plaster and cementitious mixes to structurally sound concrete floors, walls, columns, beams, steps and ramps. Weld-Crete® can be “painted on” in a single application 1 hour to 10 days prior to concrete placement. Use Weld-Crete’s® open time to your advantage in bonding to concrete shear walls when you need a time lapse between application of bonding agent, placement of reinforcement steel, placement of formwork and placement of concrete. 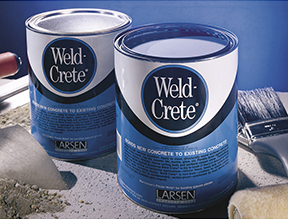 Weld-Crete® is also used for: bonding setting beds for ceramic tile; bonding Portland cement plaster and stucco mixes; and to bond to surfaces such as brick, block, tile, marble, metal, glass block, soundly adhered paint (non-soluable in water, i.e. casien and calcimine paints), and silicone. 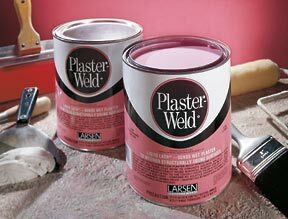 Plaster-Weld® bonds new plaster to any clean, structurally sound, interior surface. The original chemical plaster bonding agent is a patented formulation incorporating polyvinyl acetate homopolymer. DESIGNED FOR INTERIOR USE ONLY, the high performance bonding of one-coat finish plaster and/or two and three coat work to concrete ceilings, walls, columns, beams, and other structurally sound surfaces. Plaster-Weld® prepares the surface to allow you to plaster directly to concrete over electric radiant heat cable, and to bond cement mortar beds to smooth concrete for installation of rigid foam insulation. Concrete, brick, block, glass, ceramic tile, wallboard, metals (e.g. sheet lead in x-ray rooms) and marble are suitable sound surfaces, structurally. Plaster-Weld® can be used over paints having oil, rubber or vinyl bases, and over silicone-treated surfaces, as well as latex paints.